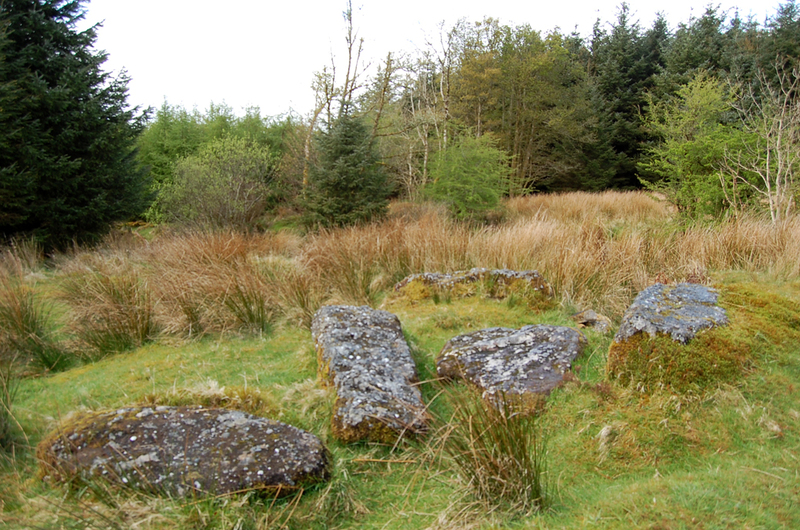 The ‘Giant’s Grave’ is the remains of a Megalithic Tomb and the resting place of ancient warrior Bladhma, after whom the Slieve Bloom mountains are named. Situated by the County river, on the Laois/Offaly border in Killinaparson. Even in the 1860’s all that remained of the Giant’s Grave were seven or eight boulders of local conglomerate, none so big but that two or three men might lift it (Stanley 1868-9), which had been disturbed sometime in the latter part of the eighteenth century by a man named Purcell, who was said to have explored it and found therein a spur of rude and antique workmanship, composed of solid gold (O’Hanlon 1907). Canon O’Hanlon describes the Giant’s Grave as a barrow and says that it too had the form of a mound when Purcell explored it. The structure was situated on the bank of the County river, hard by a cottage occupied by a herd employed by a Mr. Davies in the 1860’s, but it is now in the midst of a spruce forest.